The Kehoe-France Schools in Louisiana have a reputation for excellence. Brad Humphreys, principal of Kehoe-France Northshore in Covington, understands the inherent pressures of academic success. 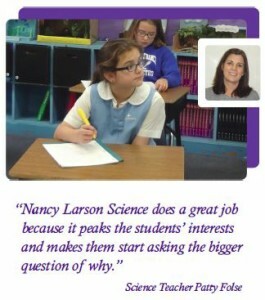 The consistent goal to foster an outstanding learning environment where students are prepared for future endeavors is one of the reasons he appreciates the rigor of Nancy Larson Science. “Nancy Larson Science is a great starting point for our new teachers, and it provides a good reference point for veteran teachers.” Humphreys appreciates when he gets compliments from parents about the science program, the instructional content and the hands-on activities. Fourth grade and middle school science teacher Patty Folse notes that doing different activities makes science fun for kids. Folse said Nancy Larson Science helps her emphasize reading and mathematics.